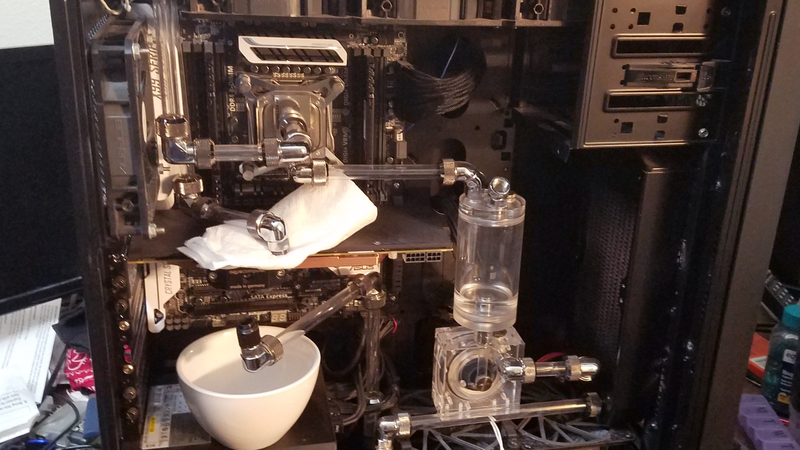 And the system is water cooled with a full custom loop, 7x120mm of radiator capacity, and PETG tubing. With the latest release of the GTX 10-series of graphics cards, I decided to take the plunge and get my wife a GTX 1080, specifically the EVGA GTX 1080 SC ACX 3.0. Like with the previous graphics card upgrade that took the system to the R9 290X, I installed the new card and set up a bypass. 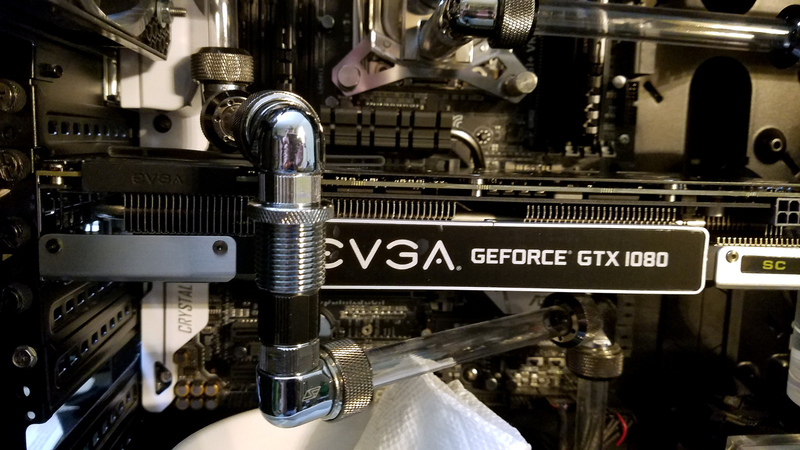 One thing I’ve always liked about Swiftech‘s fittings is the wrench fit. In the case of these fittings, a 17mm wrench allowed me to get them loose. 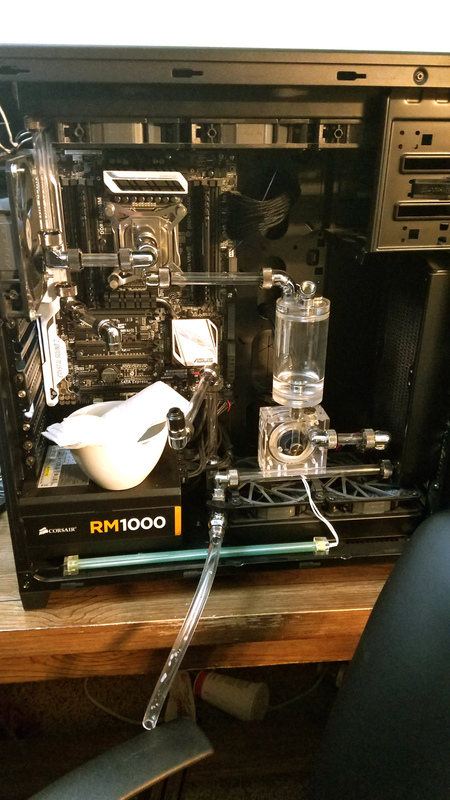 I considered using soft tubing for the bypass, which would’ve required tearing more of the loop down, until I realized an alternative. That is an AlphaCool bulkhead fitting, meaning it has female G¼ threads on both sides. After making sure both fittings were reasonably secured, I filled and bled the loop, using the variable rotor on the D5 to help push air out. So like last time there will eventually there will be a revisit on this. It’s just not going to happen as soon as I’d like. Why? The EVGA card is going back to NewEgg on RMA. The coil whine was unbearable under load. The video below doesn’t do it justice. It’s louder than the video represents. Upon doing some research I was able to learn that others were also having coil whine issues with this same card. One thing I found very odd is the recommended solutions, which included changing out the power supply and/or motherboard. Yeah, not happening. Despite how many apparently say it works to cure coil whine, I have to disagree. For one, I have two GTX 770s in Mira. They suffer from coil whine. And this is the third mainboard and third power supply those cards have been connected to, and they’ve had coil whine issues across ALL setups. So changing out the motherboard or power supply is unlikely to solve the problem. So instead it’s going back on RMA. But I did put up with the coil whine long enough to take some benchmarks. Now it is unlikely these points will change once the card is on water. What will change is, of course, the temperature performance. The card shot up to 80°C relatively quickly under the various benchmarks. The CPU got up into the low 40s. 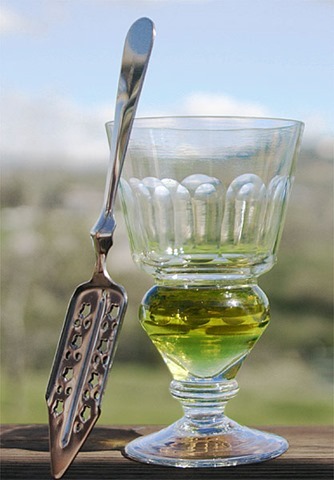 But like platform upgrade in February, Absinthe will be getting a pretty thorough cleaning when I’m ready to install the block. So the card will be going back on RMA and the R9 290X will likely be reinstalled into the system. 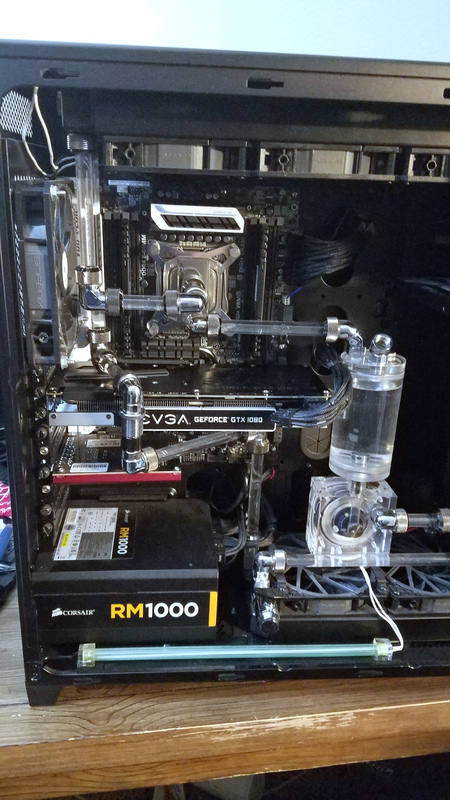 Once I have the new card, it’ll be installed with its stock air cooler similar to what I have above just to make sure it works before I do the water block installation. Oh and I might have another little surprise to go along with this when the upgrade occurs as well. So stay tuned.